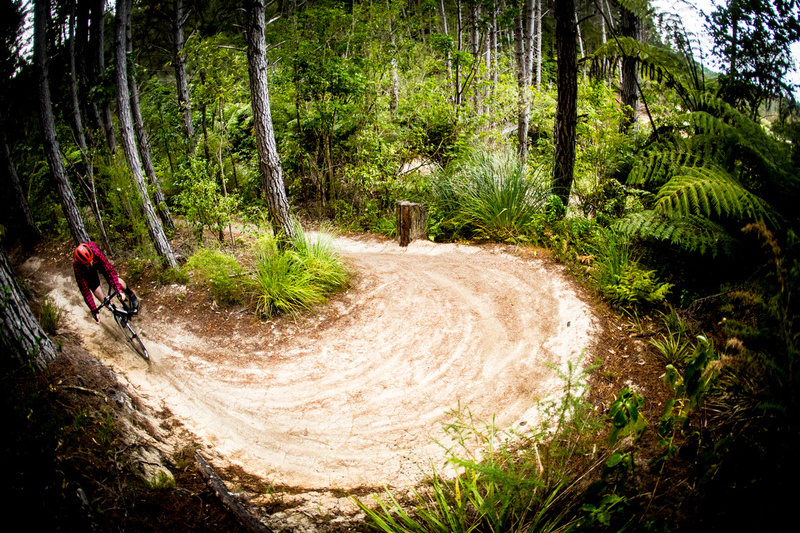 Santa Cruz bring three very secret bikes into NZ for us to ride the Old Ghost Road. When I heard there was going to be a Santa Cruz press camp with new bikes being launched, and Ride Housemartin organising the trip and that it was going to be on the West Coast, I nearly wet my pants. Little did I know the new bikes were XC oriented and one may have exceptionally skinny tyres. “Awesome”, I said. ('Crap', was what I thought.) But I'd already sold my soul so I got myself mentally prepared for riding skinny tyres in the wild wet west on some of the roughest terrain known to man and beast alike. The next curve ball was that it was immediately after the Dodzy Memorial Enduro. I could still remember the pain my body was in after this event from the previous year and the thought of having to ride XC for a further four days after that brought me out in a nervous sweat. With two weeks to go, I put in some extra miles (mistake) and packed and repacked my bags until the time came to get on the ferry in Caleb’s Suzuki SJ413 jeep for the wildest adventure in which I've ever partaken in 49 years. Having gotten through the DME with no injuries except for thighs and forearms that no longer worked, sit bones rubbed through my skin and mentally scarred from Caleb’s 4WD escapades, I was in perfect shape and got dropped off at a Nelson restaurant to meet the other press, the Santa Cruz team and the bikes we were to live with for the next four days: a fleet of carbon hardtail race 29ers, 27.5s and cyclocross bikes. Holy crap, would I survive this? Not having ridden a hardtail off-road since 1991, never having ridden a cyclocross bike EVER, and realising that I was with a few legends from the best international magazines, I can tell you I freaked out and spent the next hour at the bar getting as much Dutch courage as I thought I could get away with without making a complete fool of myself. Stage one of the adventure was to drive to the idyllic golden beaches of Kaiteriteri at the edge of the Abel Tasman National Park. After a quick bike assembly we headed off into the adjoining mountain bike park for a quick shred and photo-shoot with Sven Martin behind the lens. Thankfully Caleb was still with us at this stage, so my cyclocross experience was delayed while he grabbed my Stigmata, put a longer stem on it to fit his 6’5” of awesomeness and proceeded to hit a tree, flip over the bars and register a 2.8 on the Richter scale. When I managed to clear the tears from my eyes I had a good hour of high-speed, smooth trails on the uber-light Highball 29er. Now this bike is a serious weapon. I think I only changed gear a couple of times as it was so easy to just stomp out of the saddle still in my descending gear when a surprise climb popped up in front of me. The zing and trail absorbtion is astounding with this frame; there was no unwanted flex and quite often I was in too hard a gear so just hammered a bit harder and the bike would just accelerate with a snap. This was getting pretty addictive. After dinner the heavens opened and torrential rain hit the top of the South Island as we hit the sack and dreamed of swollen rivers, waist deep bogs, cancelled heli-drops and sodden clothing. Thankfully we awoke to blue skies and a long range weather forecast that would’ve made Fiji proud so we piled into the vans to commence the roadtrip to the coastal end of The Old Ghost Road where the shiny new carbon bikes would get the hiding of their lives. After a few hours of driving, coffee, great food and me keeping my mouth shut so I wouldn’t embarrass myself, Sven yanked on the handbrake at Granity, a quaint little mining town just north of Westport. The moment I'd been dreading had arrived, as the CX Stigmatas were unloaded and we stripped off and into our riding gear for a two-three hour gentle climb up Charming Creek to the Rough and Tumble Lodge where we would base ourselves for the next few days. I was at a serious disadvantage as Caleb had put about six months worth of abuse into the one hour thrashing aboard my CX bike the day before. I struggled to keep up as I kept trying to tune my gears as the chain was rubbing up front. Luckily I had the Santa Cruz go-to guy Josh riding beside me to have a look, and lo and behold my right crank was falling off. Thanks Caleb. It was then I found out that the dirty trucker-cap-wearing, mirrored-aviator-shaded, grubby-jeaned, foul-mouthed guy that I assumed was the Santa Cruz roadie assistant I had been ordering around was actually Joe Graney, the Chief Operating Officer who pretty much runs the whole shebang. So I was feeling pretty low down on the totem pole as we headed up the gorge riding an old rail-line that was used to bring coal down out of the hills in the old days. Gentle it was not. The stunning scenery was balanced by the railway sleepers that were still in place and many were protruding 4-5 cm from the surface. It made for a rough ride and it was testament to the quality and build of the stiff and light carbon Stigmata frame and fork with Enve wheels that allowed my normally 160mm-suspended body to still enjoy the rigid beating it was getting. I threw down a sprint or two to impress on the other journos that I wasn’t just some old washed-up 90s legend, and I showed them that I was indeed old and washed up as they reminded me that they were younger, fitter and very used to this type of machine. But I smashed it all the same and pretended I was on my trail bike and hucked some drops and drifted some corners and soon forgot I was on drop bars (except when I hit some tight corners and found my hands weren’t anywhere near the brakes). I learnt pretty quick with some great tips from The Radavist’s John Watson who is the epitome of CX cool. Hitting a long gravel-road descent to the lodge, we raced for the win and got plenty of high speed two-wheel drifting in on the wrong side of the road to arrive at base camp and find the Chief had got the van stuck on the driveway, so I spent a while getting it stuck even further with Lodge owner Susan’s 4WD. Things weren’t going well with my relationship with Joe and my dreams of a cheap bike at the end of the trip were fading fast. The Stigmata hasn’t been available for a few years as Santa Cruz knew that some radical changes were coming to CX and they wanted to wait till the timing was right. It comes in Carbon only, and unlike the Highball, the frames are available in CC only. CC is the high-end frame that SC have always made but lately their carbon offerings are now also available in C which is a cheaper way of building the exact same frame, but with a different carbon which ends up a bit thicker and heavier, but you still get the same ride quality as with the CC. You can’t tell the difference apart from the graphics following the model name on the top tube. What we have is a full carbon frame with their own carbon fork, integrated headset, PF30 BB shell(so the frame can be built to fit 41mm tyres) and a pretty rad chainstay/axle rear disc brake mount. Yes, this bike is disc only and comes with a high direct-mount for a front mech if you go for the SRAM Red 2x11 groupset. Go for the 1x11 group and you get SRAM Force CX1 with the X-Sync ring. Then you have Maxxis Mudwrestler rubber on ENVE rims /DT240s hubs or WTB i19 rims on DT350 hubs. Zipp supply the stem, bars and carbon post with a WTB saddle. Cable routing is internal and super tidy, and has the internal frame sleeve for easy brake threading with room to install the thingamajigs which unclip your brake hoses. The front and rear shift cables have ferrules in the frame so bare cable runs through the down tube and has a removable cover on the BB underside to make this as easy as pie. I had the 1x11 version and this would be my choice, as who wants to change gear up front in the mud? I gave this bike a hiding on fast, stuttery railway sleepers and the chain stayed on fine. The SRAM brakes were amazing and had me throwing skids and nose wheelies all over the place. Also on offer is a Stigmata CC Rival. For a 56cm, frame weight is 1013 grams, complete bike with Red /ENVE is 7.42 kg(16.35 lbs), fork is 424 grams. I never knew what a revelation a stiff, strong and lightweight hardtail would be and I felt like I could ride forever. This is one ripping machine and I put down the hammer so hard in places, the flex from the stem bar combo was quite noticeable but not unwanted. Flying in the heli over the as-yet-unfinished 10 km mid-section of trail, I can’t wait to ride the whole thing as it looks spectacular with long, flowing descents and hundreds of snaking switchbacks. Heading out after a night in the hut. After a long night of hut life in Ghost Lake Hut filled with snoring, farting and creaking, we were woken early by Paul the trail-builder starting his morning ritual of coffee and breakfast. We flailed about getting caffeine and carbs and setting up the Highball 275 race bikes which had been dropped off by heli the day before. Unfortunately there had been a mix up at HQ and they sent me a 60cm Stigmata for my 3-hour downhill to Lyell, so alas I had to stick with my trusty 29er for the day with the consolation of a dropper-post installed. Incidentally all the new frames run 27.2 seatposts to achieve a bit of forgiveness from post flex. I jealously eyed up the 275s as the gang got ready. Not because I thought it was a better bike (you can’t tell them apart as it’s the same frame design and build-kit apart from a standard headset for the 29er and integrated for the 275) but because they had EXO sidewalls on their tyres. I really wanted to push the bike to its limits, but hey, I did that to my 29er anyway and the following rock-infested descent gave me three huge gashes with immediate blowouts. Luckily they were all on the rear and was a testament to the ENVEs that they didn’t get a scratch on them. Another standout was the Float fork. Super dynamic in compression and brake dive was negligible in the open setting, I think Fox may be back in the game. Also offered are a Highball CC XT (mainly XT spec), a Highball C S (mainly SLX spec) and a highball C R ( some SLX and Recon fork) if you want a realistically priced sled. The 275 XX1/ENVE weighs 8.74 kg (19.27 lbs). The alloy rim version adds about 200 grams. I was really hoping my passing manoeuvre would pay off here. Santa Cruz didn’t set out to make a different bike with the 29er v 275. Sure, the frames have different geo as they should, but they were designed to ride the same for trail or race. It's more to suit the rider; are you a 29er or a 27.5 person? Then choose your Highball accordingly. The 29er comes in M/L/XL/XXL and the 275 in S/M/L/XL. I brought a Highball 275 back home with me and have had a couple of rides on it already. It feels so similar to the 29er that I forgot I was on it. We also got to see the Highball alloy singlespeed frame which has the brilliant swinging dropout. Sorry, it only comes in alloy though. Highball SS in alloy only. After spending time with the Santa Cruz guys, witnessing their passion and perfection, knowing their history of only settling for the best and having so few failures compared to their competition, I can see why they have a cult following. I would be proud to own one of their bikes and be a part of the Santa Cruz family.